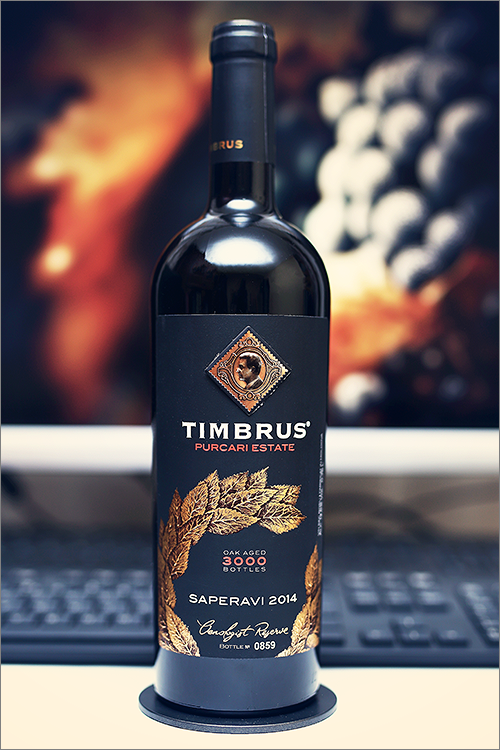 Tonight we are going to review a very rare wine – Saperavi Oenologist Reserve 2014 by Timbrus. This is a single varietal saperavi wine, signed by Manuel Vicente Ortiz Martinez, produced in the Stefan-Voda region in the south-east of Moldova. Saperavi is a teinturier grape variety, which means that the flesh of the berry is also dark, therefore the wines are very deep in color with nuanced acidity and firm tannins, which makes them respond well to ageing. Although Georgia is the birthplace of saperavi, there are a handful of other european countries that also grow and produce saperavi wines, and Moldova is one of them. Some say that the saperavi wines made in Moldova are of a better quality that the ones from Georgia, and tonight we are going to test this theory! Noble and deep garnet color, with elegant ruby hues towards the rim of the glass. The nose is strong, filled mostly with red and blue fruit flavours: blue plum, lolyberry, ripe sour cherry, redcurrant, cranberry, red apple, wolfberry, marionberry, rowanberry, cherry tree wood, red mirabelle and leather. An instant later the nose is filled with elegant notes of nutmeg, red pepper, anise and some subtle hints of cinnamon. The wine is dry, with high alcohol level, high acidity and smooth tannin. It feels velvety, noble and smooth, with a complex and harmonious body. This is a well structured, fruity and elegant wine, as it tastes ripe and seedy, with delicate woody hints towards on the palate. The wine is very well balanced and it has a nuanced tart and crisp feeling on the mouthfeel. It has a very long finish and an velvety-smooth aftertaste. Conclusion: this is a very fine saperavi wine that has just passed over its prime form – noble, elegant and very well structured – a wine that can still age for another year or two before it will start its decline. The wine has been produced in a limited edition of only 3000 bottles, and, as is the norm for these kind of wines, it has been aged for 18 months in oak barrels and underwent another 30 months of bottle ageing. To be honest, this is not a classic saperavi wine, as there’s little flamboyance in it, instead, there’s finesse and elegance, and this my friends, this is pure delight. This is that kind of wine that requires delicate food pairing in order to open up and here balance is key – our recommendation is to pair it with meaty dishes rich in irony flavours, like for example a filet mignon steak with red wine reduction sauce, just remember to keep the filet mignon steak rare. Enjoy! Solid review. I have written several articles about Saperavi on my blog. My articles have been on the North American producers. There are only six with five located in the Finger Lakes Wine Region of New York. Saperavi is made in a dry style here and is now being made into Rose. You can find my blog at wpawinepirate.wordpress.com then search Saperavi.